Last march I published a research article on the notebook maker Moleskine, Moleskine SpA: Paper Is Not Dead. I don’t know a lot about the Belgian auto group. This is the private equity owner that’s selling their stake in the company and the rest will be sold after at the same price. The buyer, D’Ieteren NV is a Belgian car importer and that’s all I know. I don’t see the connection between the notebook maker and the auto group but it looks like that D’Ieteren NV might be turning into a holding company. The market didn’t seem to appreciate the move by looking at drop in D’Ieteren NV share price. I think Moleskine could warrant a higher price but I don’t think they will get it for multiple reasons. Moleskine is a great company to own for the long-term and will definitely create shareholder value for the many years to come. But because the biggest owner agreed to sale (private equity need to exit their position) and Moleskine lacks the visibility of a big market (should be listed in NY or Milan), it won’t get much more unless somebody else steps up. The offer is only 10 cent over the IPO price of 2.30. I find that disappointing. The big winner in all of this is the private equity owner and shareholders who bought it when it was trading in the dollar range. It’s a great brand with great products and great legs to go on. Now if you really love the company and still want to be an owner, you might have to buy shares in D’Ieteren NV. I don’t much about them except that 1) they have been around since 1805 2) it’s family owned and 3) they still to have a long-term vision. Without it they wouldn’t have been around today. My latest update on NAPEC (NPC). It’s been a year and a half since my last article on NAPEC. I got over the latest developments and a re-assessment of the valuation. NAPEC has now turned the corner on their troubled past and operations have been improving. and I still believe that NAPEC is undervalued. Below is a small sample of the article since Seeking Alpha has the rights to it. It’s free for the next thirty days. 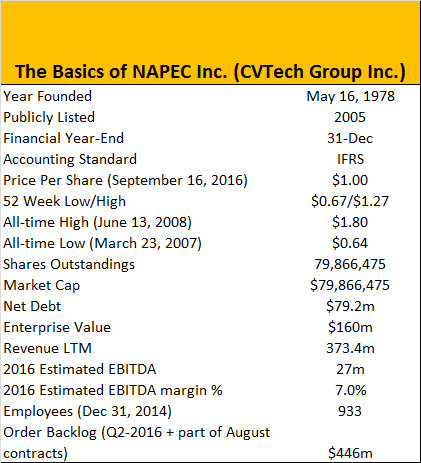 NAPEC is a former turnaround situation that is still trading at a bargain. Backlog and revenues are at an all-time high. It’s time to re-assess NAPEC. The company’s intrinsic merit is unrecognized by the financial community. This is a mispriced security with a large gap between current price and value. There are many catalysts that could “wake up” the stock. The market overreacted to the Q2-2016 guidance miss. CVTech Group officially became NAPEC Inc. (OTC:CVTPF, TSX: NPC) in September 2014. Throughout the article, NAPEC Inc. can also be referred to as NPC, CVTech Group, or the Corporation and its subsidiaries such as Riggs Distler and Thirau Inc.
NAPEC Inc. is primarily traded on the Toronto Stock Exchange under the sticker NPC. In the last ninety days, NPC has an average volume of 139,322 shares with an average daily value of $152,623. Note: Dollar amounts are in Canadian $ unless mentioned otherwise. USD-CAD 1.32 Price of 1 USD in CAD as of September 20, 2016. This is my third analysis of NAPEC. The first two were over a year and half ago. At the time, NAPEC was going through some major changes. This is an update on the progress and valuation of the company. To understand where NAPEC is today, it’s important to understand how it got here. My first article, “NAPEC Inc: 30%-40% Upside In Potential Turnaround,” published on March 11, 2015, offers an in-depth analysis of NAPEC. It’s a long detailed article that explained the turmoil and the changes that followed. If you have a PRO membership, I suggest you start with this one. “The NAPEC Turnaround – Mispriced Security Offers A Lot Of Upside” provides an update on my original thesis. This article is free for access. Source: Google Finance. NPC -3.85% versus S&P TSX -2.64% from March 13, 2015 (original publication date) to September 20, 2016. Since my initial article, NAPEC went through a major slump for no apparent reason. As often is the case, especially in the microcap orbit, nothing material occurred with NPC that caused the stock to drop to $0.68 in November 2015; Mr. Market just decided he liked NAPEC 34% less than he did in Q1-2015. Then again, on no particular news, NAPEC stock price managed to rebound from its trough to hit $1.27 a month ago. The trough to its peak represents an 89% gain! On August 11, 2016, NPC released its Q2-2016 results, and the stock dropped 16.6% in one day. NPC stock price has been floating around $1 since. Here’s the part that’s sometime hard to grasp: the $1.27 NPC, the $0.68 NPC, and the $1 NPC is the same company. There was nothing fundamentally different in NAPEC that would suggest an 85%+ price range movement. The intrinsic value of NAPEC didn’t change that much; if anything, it went up. This brings me back to The Intelligent Investor by Benjamin Graham. In this famous book, Graham states that a stock is not just a ticker symbol – it’s an ownership interest in an actual business, with an underlying value that does not depend on its share price. The market is a pendulum that forever swings between unsustainable optimism (which makes the stocks too expensive) and unjustified pessimism (which makes them too cheap). For more information on Graham and market fluctuation, I invite you to read Chapter 8 from The Intelligent Investor. Before I state the investment case, here’s a brief overview of NAPEC. NAPEC stands for North American Power and Energy Corporation. The new name was adopted by the company in September 2014, after being known as CVTech Group for many years. NAPEC operates in the energy sector. It provides construction and maintenance services for the electricity and heavy industrial markets. The company operates in Québec, Ontario and the northeast United States. NPC builds and maintains electrical transmission and distribution grids, as well as networks for gas utilities. In addition, it installs gas-powered and electric-powered heavy equipment for utilities, gas-fired industrial power plants, and petrochemical facilities in North America. Dr. Henry E. Singleton (1916-1999) was a business genius. He’s the founder of Teledyne, at the time one of the US’s largest conglomerates. Created in 1960, Teledyne was formed to capitalize on the coming revolution in which digital technology would replace analog devices and systems in everything we could touch and imagine. Loosely translated, Teledyne means Power Through Communication. Henry Singleton was the idea behind the outstanding book The Outsiders by William N. Thorndike. Singleton is a master capital allocator and absolutely crushed the market. He could read a book a day and play chess blindfolded. He kept a low key profile and rarely gave interviews. This explains in part why most people aren’t familiar with him. Little is known today of Singleton’s achievements as a capital deployer and there’s a lot to learn. Here’s the 6 pages Forbes article. I got this from Francis Chou’s latest fund letter for the first half ended June 30, 2016. Some twenty years ago, the following test was developed to ascertain whether or not an individual could make it as a value investor. As you are well aware, investing is not done in silos. You have to take all pertinent information and check how it is interrelated. There are 4 test questions. Answer them in sequence. Don’t miss one. Please do not cheat. 3. The Lion King is hosting an Animal Conference. All the animals attend … except one. Which animal does not attend? Okay, even if you did not answer the first three questions correctly, you still have one more chance to show whether you have any innate qualities to be a value investor. If you get it wrong, you could be deluding yourself and may have to seek counseling. When this test was administered to fourth graders, most of them were able to answer some of the questions but 90% of adults could not answer even a single question. This shows what Modern Portfolio Theory can do to investors. I don’t know whom to give the credits to for this chart and it’s getting passed around all over the Internet. The chart includes current legend and investors who are no longer among us. Then with the freedom of incorporation in the 19th century, the private corporation — the seedbed of the industrial revolution and the manufacturing corporation. Last scene of all that ends this strange eventful history is the mindful corporation — sans machines, sans man, sans money, sans everything. The last line is in reference to the rise the intangible corporation. How many corporations are there today that have no assets, no profits, and are worth billions? Companies like Whatapps comes to mind. According to a study by merchant bank Ocean Tomo on the makeup of public company balance sheets in the S&P 500 between 1975 and 2015, the figures showed that at the end of 2015, 84% of assets held by S&P 500 companies were intangible by nature, up from only 17% in 1975. Ocean Tomo calculates intangible assets simply “by subtracting the tangible book value from the market capitalization of a given company or index,” so the rise in intangibles since the 1970s is in part just a reflection of rising stock market valuations.